There’s an old saying — “Who owns the information, owns the world.” Indeed, it is difficult to overestimate the role of monitoring and analytics in social media. These are important stages for successful business development and effective promotion on the web. We have collected 20 social media analytics tools that will help SMM specialists to do their job more efficiently. Our list includes services for analytics and work optimization on social networks, tools for scheduling posts and social media monitoring system. Googling lists of tools, reading tons of reviews, and messaging support team with “what this feature made for?” is a time-consuming process. Even more, such kind of task strikes a nerve. We could say that everybody has been there (is it right to overgeneralize? ), but we’ve decided to take action and make a profound analysis of tools marketers, bloggers, and media write about. Take a look at this visual social media analytics tools comparison to know better about supported platforms, pricing and days of free trials. This is about crafted content, support, and promotion. 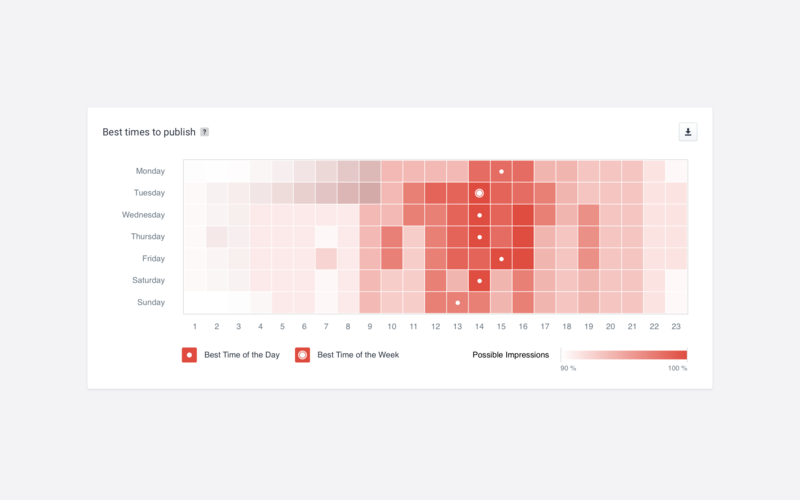 PromoRepublic is a social media management platform that helps agencies, freelancers and small businesses create a variety of content and automate its posting to social. Along with its measuring tools, you get the learning materials like webinars and team support. With statistics that PromoRepublic provides you with, you can check views, clicks, external links visits, and posts efficiency. The service offers a 14- day free trial period and the starting price is $49 per month. 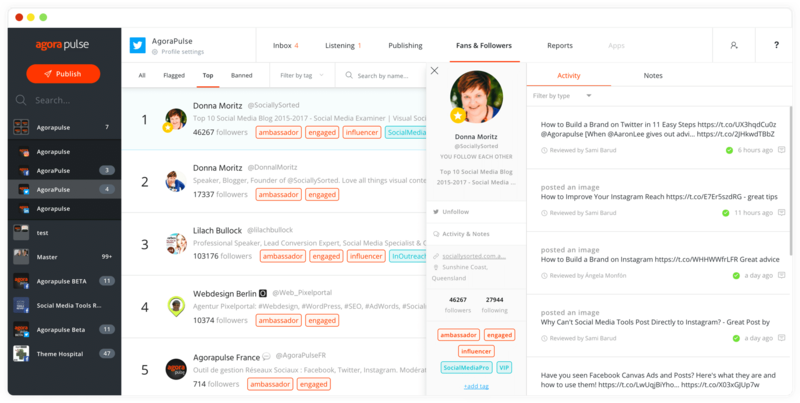 Sprout Social is a social media monitoring, marketing, and analytics software that helps business customers to manage and organize their activity on Twitter, Facebook, Instagram, LinkedIn, Pinterest and Google. Per TechCrunch, their current users include such popular brands as Evernote, Adidas, West Elm and Edelman. As well as other diligent services, Sprout Social allows you to test their social media power before purchasing during a 30-day trial period. There are three plans for you to consider: Standard for $99 per month, Professional for $149 per month, and Advanced for $249 per month. In no so far back in 2006, Google Analytics began tracking sites. It became popular because of its basic features. However, it requires more insights to understand what people are experiencing while visiting your website than Google Analytics can provide you with. At the same time, Huffington Post, WNYC, and KCRW are using Google Analytics to increase the readability of their articles, since it provides average page depth information. Free for everyone, but in case you have high traffic and you’d like to upgrade it to Premium, the price is $150,000 which makes them unreachable for social media marketers. If your business is Instagram or Facebook oriented, then Iconosquare may meet your needs pretty nicely. This is a social media analysis and management tool which provides you with social media metrics about the followers on Instagram and Facebook. Among their users, you can find such popular names as LUSH and National Geographic. The 14-day trial period allows you to get a sense of almost all of their features. The app will show you everything you need to know about your account. The Pro plan costs around €29 per month while the price of the Advanced plan is €59. Before signing up for a free trial, you need to fill out a short form with your name, Twitter account, email, and phone number. A free account is available, but it’s so limited that you won’t get enough of it. Audiense helps Carlsberg and Puma watch what on their Twitter accounts is going on. Audiense has a free account option for individuals, but you will have to pay to get access to more advanced features. Audiense has two different payment plans to satisfy different needs. €9 per month for the Starter plan and €89 per month for Standard. This is an online tool for tracking social media analytics. It helps you clearly see what’s happening on Facebook, Instagram, Twitter, YouTube, Pinterest, and Google+. It’s good for those who prefer being active on multiple social media channels like Honda, Ogilvy, IKEA. Despite a really large number of plans (six! ), the analytics feature is included in four plans. The logic is tricky: Premium plan, which price is € 99.90 per month, excluding analytics for Instagram, Youtube, Google+ and LinkedIn, so you should Business plan, which price is €149.90 per month by default to control all your social media channels. The good news, you can try all the features for free for 14 days. The name speaks for itself. 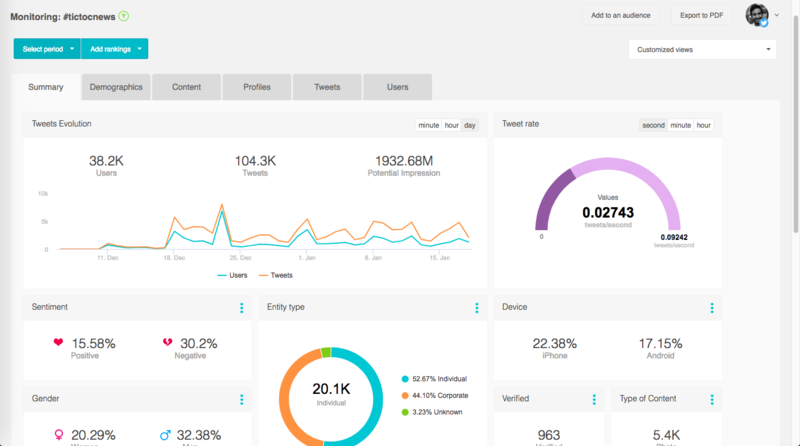 Twitonomy is a Twitter analytics tool designed to help you monitor, track and optimize your life on Twitter. Twitonomy is a free Twitter analytics tool, which, however, offers a paid premium account with additional features. Information about paid plans is available only after you sign up with your Twitter account. 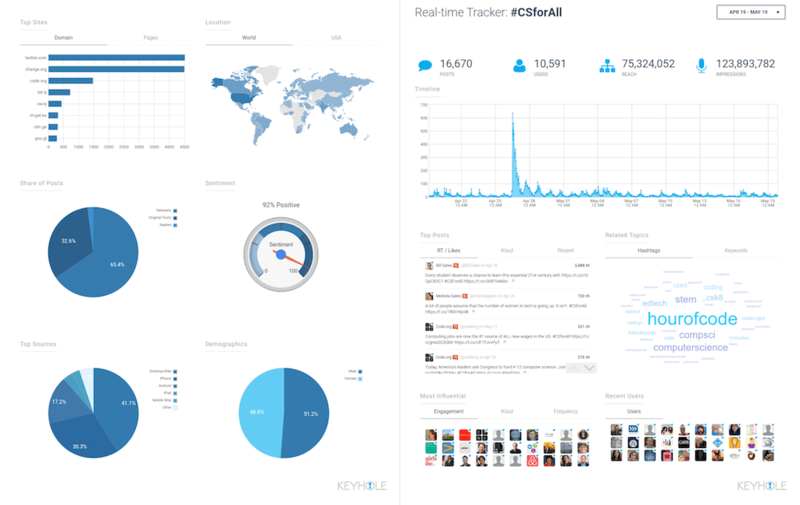 This tool tracks hashtags for Twitter, Instagram, and Facebook in real-time. Spotify, Google, L’Oréal, Uber and the United Nations take care of their brand mentions and use Keyhole to understand how their people feel about their brand and competitors. There are several plans for you to consider. $199 for the Professional plan which unlocks your basic features and $999 for Agency plan which is useful when managing multiple clients. 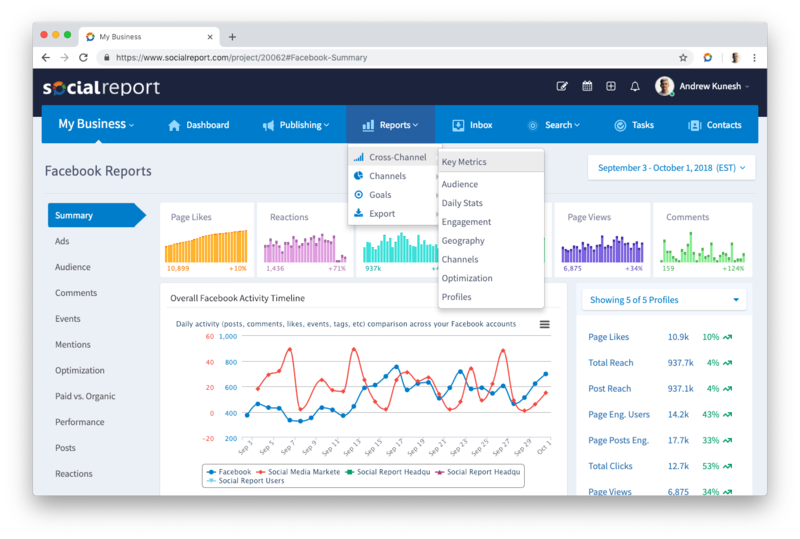 SumAll is a cross-platform marketing analytics tool combining social media, web traffic, sales metrics and other data to grow your business. It supports Facebook, Twitter, Instagram, Square and Google Analytics. 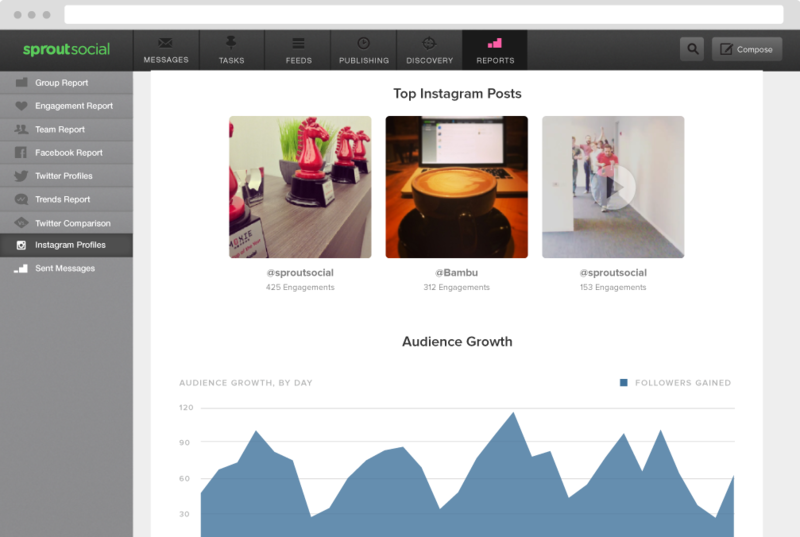 Quintly provides analytics for Facebook, Twitter, LinkedIn, Instagram, YouTube, Pinterest, and blogs. When you sign up to Quintly and add at least one social media profile, the tool allows you to start their tour to learn about the features. You will go through every tab and find out what they mean. Their clients are Coca Cola, Warner Brothers, Adobe and many others. This tool has a free plan which gives you a 14-day test-drive. For the full set, be ready to pay at least $100 per month. This is a social network management platform that works with popular platforms like Facebook, Twitter, Instagram, LinkedIn, and YouTube. Their clients include such big brands as Dove and Yves Saint Laurent. It offers a 28-day free trial and 4 subscription plans from $49 to $299. The least expensive plan includes three social profiles, one user, a mobile app, and publishing and monitoring tools. At the very beginning, Tailwind was one of the few Pinterest-only social media analytics tools. Now it supports Instagram and lets you know the best time for posting. It offers a free trial period (100 free pins) and several plans (bloggers and small businesses start at $9.99 per month and Pro for large brands and agencies can go for $799.99 per month ). Brand 24 is all about analyzing your appearance in social media. It monitors social media platforms like Facebook, Twitter, and Instagram, and analyzes the web’s keywords. It has a mobile app, Slack integration, and a bunch of useful analytics features. All you need is to choose what topic you want to analyze. Brand 24 is more about what is happening around you, about what people are saying about you, and about engagement and analytics. They gained the trust of Vichy, Intel and H&M. The tool offers a 14-day free trial and a minimum of $49 per month for the subscription. 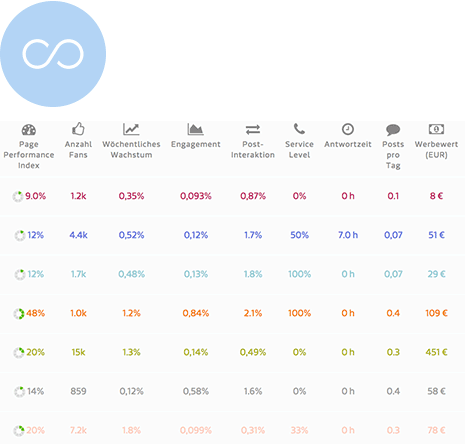 True Social Metrics is one of the best social media analytics tools due to the number of platforms it supports (10 social media from Standard pack + 3 from Premium). The app allows you to connect multiple social accounts, even those you do not own, and analyze social media platforms and compare them. MOZ, Chicago Bulls have already become their trusted clients. There is a 30-day free trial available. The small plan starts at $30 per month and includes only three Twitter, Facebook, and YouTube accounts. If you want to get access to all the other social media channels, you should choose Medium plan worth $100. This is a special app in our list of social media analytics tools – it supports 19 social media (we bet, you can’t name them all!). The starter plan costs $49/month. Additionally, there is a 30-day free trial available. One of the best free social analytics tools for Twitter by Moz. 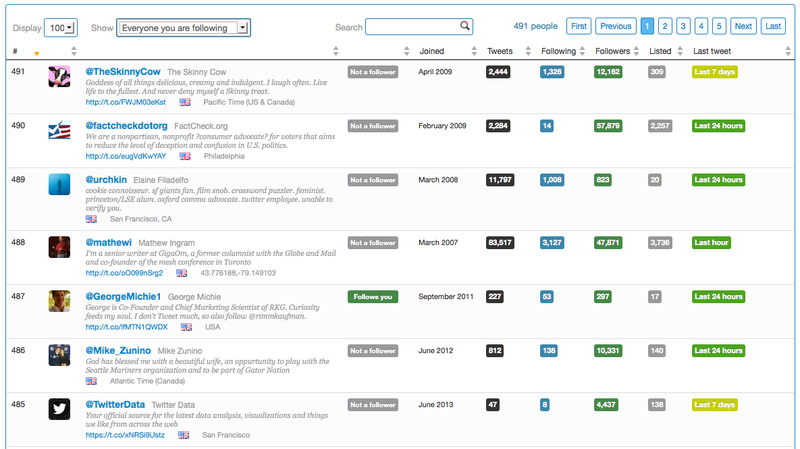 Followonk lets you analyze any Twitter account, your followers, where they are located and when they tweet. It’s a way to find and connect with the top influencers within your industry. The free plan does not include analyzing and optimizing options, so if you need them, get ready to pay at least $29 per month. 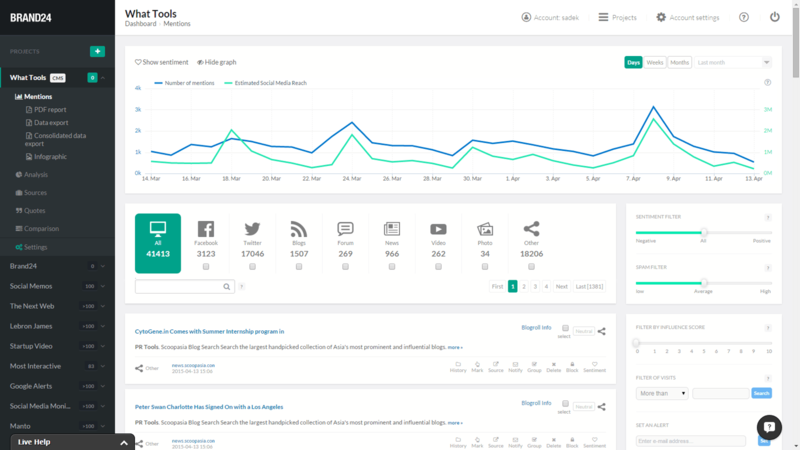 This is a social media management platform that helps you schedule and analyze your social media marketing campaigns. As your startup grows, you have the option to upgrade your account which allows integrating more accounts. Among their clients, you can find well-known Visa and PennMutual. The tool offers a free limited plan. A 30-day free trial Pro version is available. 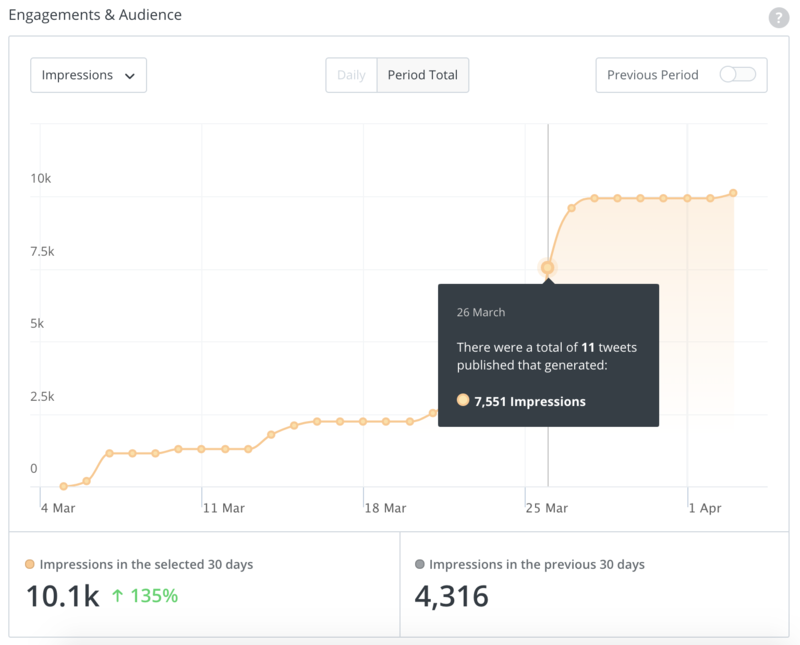 You can build custom reports for your social accounts with granular analytics that include growth, shares, mentions and so on. Some social media analytics report templates are available for free, others are available in Pro and Enterprise plans. 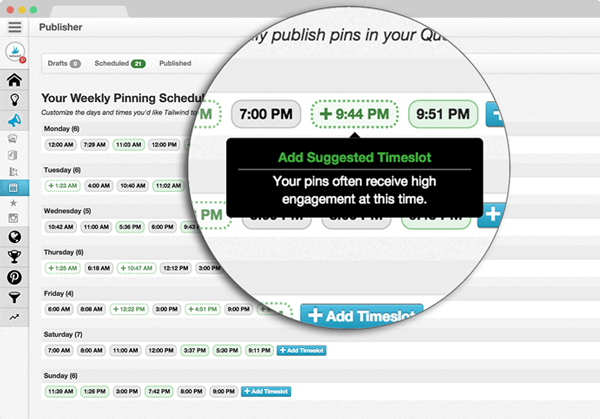 Buffer is a content scheduling platform that helps to manage multiple social media profiles. It’s interesting that Buffer started off as a scheduling tool for Twitter only. Now it supports such the major social media platforms as Facebook, Twitter, Instagram, LinkedIn, and Pinterest. They have many clients with big names, including Intercom, GitHub, and Microsoft. This data and social media analytics platform offers several options. You can install a tracking product on your Android or IOS smartphone and use it absolutely free. Simply add Facebook, Twitter, Instagram or YouTube profiles of the brands you want to follow and track every post. Their clients are such well-known names for you as Nokia, Tiffany & Co, and Volvo. As is usually the case, the main difference between the plans is the purpose of usage. Free trial for Analytics is available, but be ready to pay $1,000 per month after it finishes. 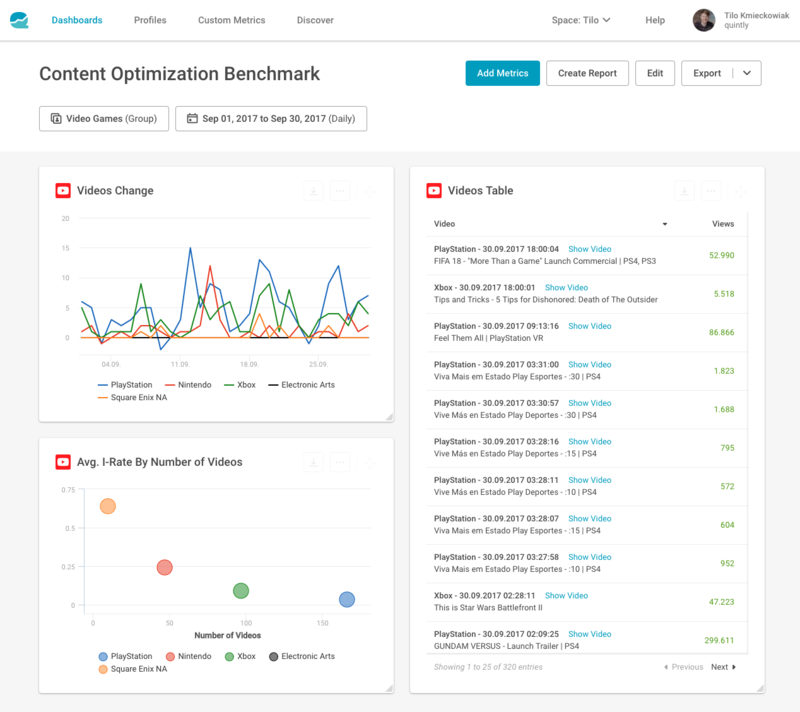 Socialbakers is one of the best AI-powered social media marketing analytics software is designed to manage and measure everything from social media to your audience in one place. The well-known names in their list of clients are Lexus and Desigual. The number of interactions and mentions, user activity, moving averages of number of interactions per 1000 followers, etc. You have 14 days to try the demo version for free. The smallest plan costs $200 per month and includes 10 profiles, 5 user seats, and email support. A mobile app is also available. Which Social Media Software Should You Use? This world has a fast tempo. Every day may come with something new. It can be a bunch of new analytics tools for social media, an update, a restriction, a trend or whatever a thing that has nothing to do with marketing. 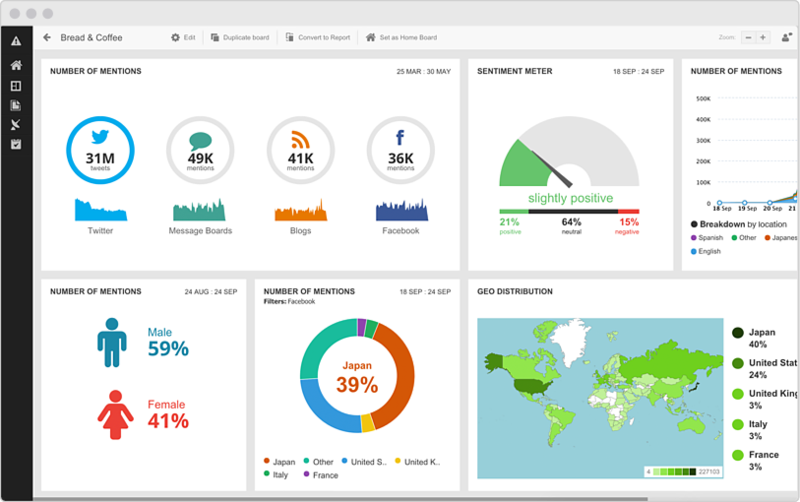 Therefore, we’ll keep this post updated with new tools for social media analytics and marketing. Good news, you won’t need all the tools from the list above. What do you need to attract and retain your first 10 customers? Answering this, you’ll get a clear idea about the features you need. We don’t presume to choose one of these social media analytics tools. We just tried to make your search easier and put up some traffic signs so you don’t miss a turn you might really need. Hey Alla, that’s one of the most impressive and comprehensive compilations I’ve recently come across! It’s extremely useful to have so many information on so many different tools available at one place. Also, many thanks for including brand24.com on the list! The list of tool mentioned here is great! Thanks, very interesting and informative article! As a blogger, I’m quite active on social. The only tool I was using so far was Google Analytics, but it’s still interesting to test out something new. Honestly, I couldn’t imagine such a huge number of social media analytics apps — and when I found your infographic on Pinterest it’s was like “Gosh, I have no idea about tracking social media performance at all”. Just thanks for such a profound research!